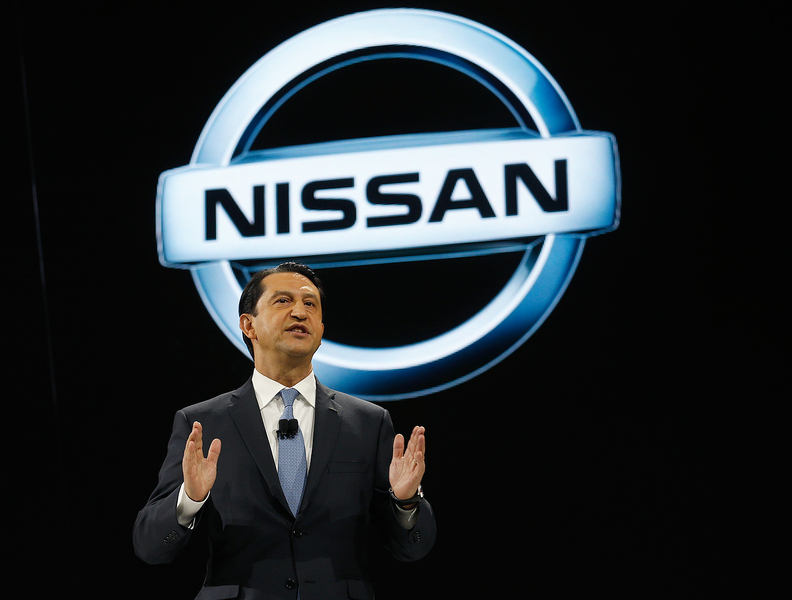 Nissan said Saturday that Munoz has taken a leave of absence "to allow him to assist the company by concentrating on special tasks arising from recent events." TOKYO – Two top Nissan executives are on leaves of absence as the automaker cranks up investigations into all corners of its global business, scouring for possible malfeasance related to the tenure of ousted Chairman Carlos Ghosn. On leave are Chief Performance Officer Jose Munoz, the former head of Nissan North America, and Senior Vice President Arun Bajaj, who heads human resources at Nissan and is also senior vice president of talent development at the Renault-Nissan-Mitsubishi alliance. When asked about his status last month outside his Yokohama, Japan, home, Bajaj said “I’m staying out of it. No comment.” Munoz did not immediately reply to request for comment. Both men were hired into Nissan during the Ghosn era are considered loyalists to the embattled former boss, Nissan insiders say. Munoz is considered a possible successor to CEO Hiroto Saikawa. Munoz, who joined Nissan in 2004 in Europe, is also a board member of Renault-Nissan B.V., the joint venture in the Netherlands owned 50-50 by Nissan and Renault. As chief performance officer, Munoz led Ghosn’s push to achieve the goals of his Power 88 midterm plan unveiled in 2011: 8 percent operating profit margin and 8 percent global market share. Nissan missed those targets, but Munoz did briefly deliver another top goal: 10 percent market share, a gain of more than 3 percentage points from the plan's starting point. Bajaj, as head of human resources, is believed to have inside knowledge of the complicated compensation plans that have come under scrutiny. Ghosn and a top ally, fellow Nissan director Greg Kelly, were arrested Nov. 19 and indicted last month on allegations that Nissan underreported Ghosn’s compensation by tens of millions of dollars over several years. Both men deny wrongdoing. Nissan did not offer further details about either executive’s leave of absence. One person familiar with Munoz’s situation said Nissan is scrutinizing the company’s performance under his leadership. While Nissan’s operating profit dropped in the year ended March 31, 2018, net income hit an all-time high, albeit with help of U.S. tax reforms. Munoz, who took on additional duties as chairman of Nissan’s China business in April 2018, aims to expand Nissan’s China market share to 5.8 percent, a level Nissan hasn’t seen since 2013. Meanwhile, in North America, where Munoz handed off regional leadership to Denis Le Vot in January 2018, market share has since plunged to its lowest since 2015. In a Jan. 6 letter to dealers viewed by Automotive News, Le Vot addressed Munoz’s leave by telling dealers that the U.S. leadership team was still committed to a midterm plan that will see about 70 percent of the product portfolio renewed over the next two years. Nissan now has a team of 100 people trolling the entire company for possible misconduct linked to Ghosn’s tenure. A person familiar with the probe said Nissan is actively auditing operations around the world, with special attention to the Middle East, Latin America and Asia. “The scope of the investigation now includes Nissan's regional operations as one major new area of focus,” the person said. Under the microscope is decision making for selecting partners for distributorships and dealerships, the persons said. These issues are an expansion of the original investigation that uncovered the alleged misconduct by Ghosn and Kelly and led to their arrests. The probe is also calling for an independent investigation of Renault-Nissan B.V. Among the suspect conduct there, a person familiar said, are donations by Renault-Nissan B.V. to Lebanese universities that were made in Ghosn’s name. Ghosn allegedly never reimbursed the company, even though the donations were externally portrayed as personal. Nissan is also looking into compensation of 500,000 euros ($570,000) paid to one Renault-Nissan B.V. board member over four years. Nissan says that is unusual because no other executives received such remuneration and the compensation was approved by Ghosn and Kelly alone.